Facial cleansing remains like the basic necessity upon which all building blocks are carefully placed. 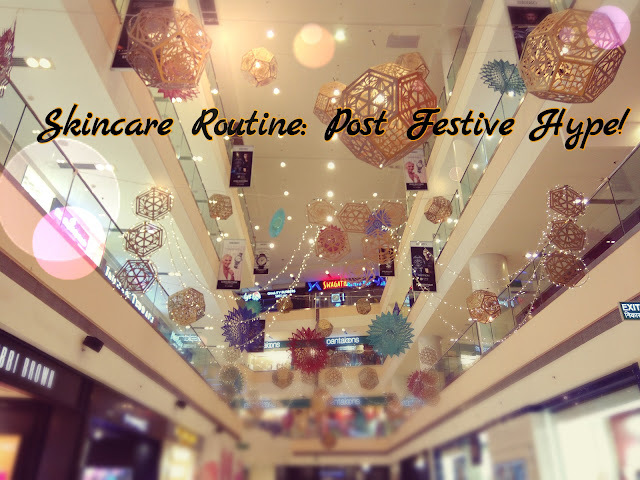 Be it for the application of makeup or for skin care routine, cleansed skin is mandatory. I have a combination; acne prone skin, so I make sure to invest upon face washes that try to curb my skin from producing more pimples. This helps me to minimize the amount of products that I apply and I ain’t really a fan of slathering too many things on. Lazy? Perhaps! Currently I’ve been loving Blue Nectar Shubhr Radiance Honey Face Cleanser. This is certainly a recommendable product! It has tried to keep my acne at bay, not hormonal ones ofcourse. It does not leave off the skin dry, gives subtle hydration but without greasiness. For complete review, read HERE. 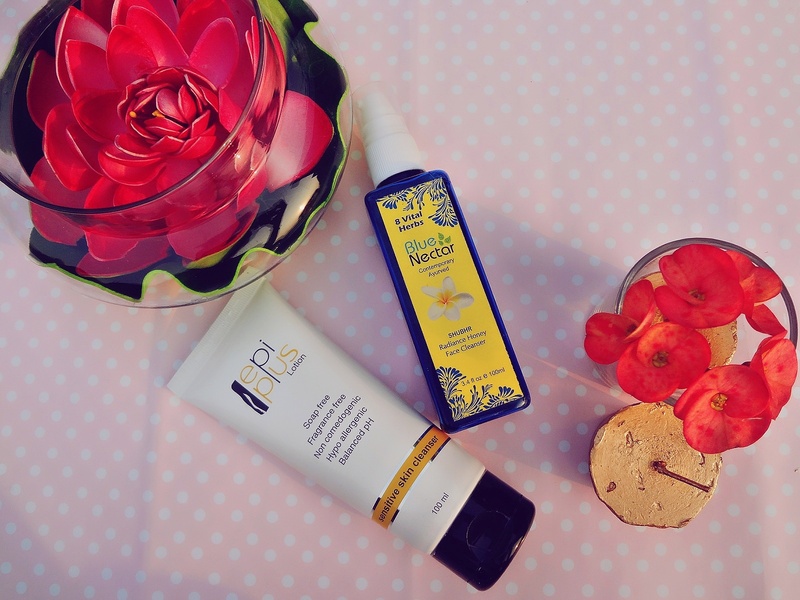 For those who have dry skin or sensitive skin, they would fall in love with the formulation of Epi Plus Cleansing Lotion by Ethicare Remedies. It’s not really a lotion but a cleanser that provides adequate hydration and deprives the facial skin of bacteria and dirt, without stripping off the moisturization. For more on that, click HERE. Being prone to acne, yes I remained in illusion for a long time of my life and then realized that there really exist facial scrubs that are meant exclusively for my skin type. The scrubs I will be mentioning shall provide mild exfoliation but have different base within which makes it suitable for different skin types. AVA Spring Pong Collection Scrub (Oily Skin) is one such scrub that has gel at its base which thankfully does not leave off the skin looking a shimmering ball! To know more about it, click HERE. I mean cream based scrubs usually end up making my T-Zone oily to a large extent and it’s after effects really fail to impress my overtly oily skin (especially in summers). So, a gel based scrub actually provides the exfoliating granules with slimy base for easy application but it saves us from excess oil. Another great scrub for oily skin is Raw Rituals Black Magic Face Scrub (reviewed HERE). If you have slight dry skin, then your favourite pick shall definitely be Fuschia Green Tea Face & Body Scrub contains Aloe vera, Olive oil, Green tea and some more amazing ingredients. Detailed review uploaded HERE. It’s not really gonna give heavy moisturization but like for combination skin it would do. Also, the granules within all these scrubs are quite minute so no harms caused to pimples! Face packs are usually restricted for weekly usage and within a short span of time; it provides much more visible benefits. It gives instant radiance and some of them actually help in calming down facial bumps. I’ve usually restricted my face packs to be completely natural and chemical free. For more than 2 years, I’ve religiously been using Udyog Gram’s Khadi Neem Face Pack which is available at dirt cheap rate. It costs you 50 bucks and goes on for really a long time! The best part, it comes in powdered form so you can customize it as per you skin. For instance, people with oily skin type can add in drops of lemon juice, tap water, spring water. While dry skinned beauties can pour in honey, glycerine, milk, etc. 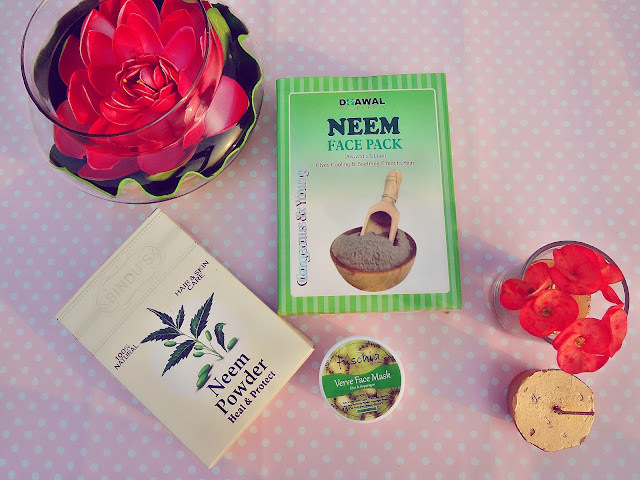 Recently I bought few things from Qtrove.com (complete post HERE) and I discovered this Bindu’s 100% Natural Neem Powder: Heal & Protect which has sharp fragrance of neem and I scoop out little quantity of this as well to form my face pack concoction along with the Udyog Gram’s Neem Face Pack. Sometimes I do add in Vitamin E capsules. But when the laziness takes over, I prefer easy to take out readymade face packs. That’s when I use Fuschia Verve Face Pack (Kiwi & Asparagus). This one is reserved for days when my skin screams for hydration, especially during the fall weather. It leaves off the skin feeling soft and smooth. Even if I do wanna skip over this step, the weather forces me to focus on this sphere. In summers I’ve usually tightened my hand muscles on the thought of moisturization because my facial pores could officially be someday certified as an oil mine! But lately, I was introduced to this gel which is as if made especially keeping in mind my skin type. It would be one of those basic essential goodies that oily skin type people would wanna carry within their vanity. Fuschia’s Oil Balancing Face Gel (Lemon Grass & Tea Tree) has definitely been my Holy Grail product for the summers. If you wanna know more about it, check out complete review HERE. But with advent of fall makes my skin dry. And when I apply foundation, the flakiness becomes quite apparent. 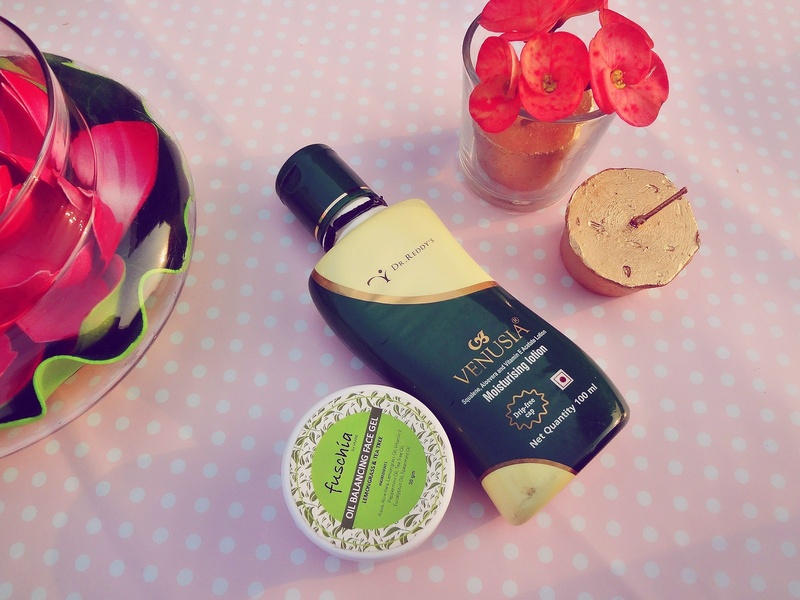 Therefore I’ve started going back to this dermatologically suggested moisturizer, namely Dr. Reddy’s Venusia Moisturizing Lotion. 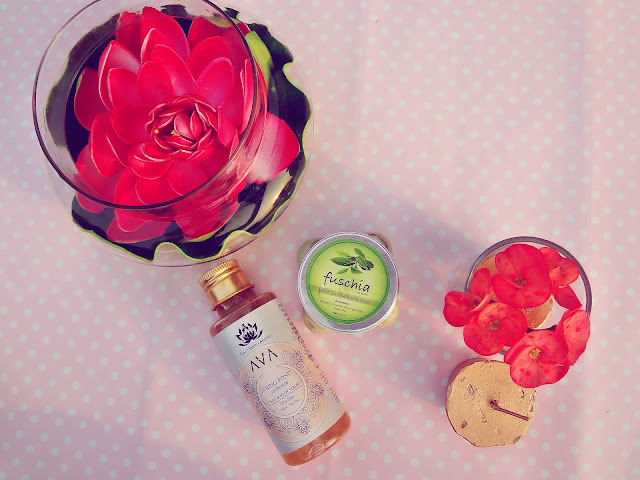 This one does cater to the hydration needs and gets absorbed within the skin quickly. It has never given me acne but in midst of summers I create detachment with it because of my skin type. Otherwise, it’s an easily available drugstore moisturizer which does its job pretty well. Which are your most trusted skincare products? Also, I kept this post concerning minimalistic products, therefore no toners or serums have been talked about.